The first verse says it all. Very powerful stuff, Staci. Poetically, crying into the wind or the sea expertly describes the futility, or hopelessness. Yet, by the end, you have resolve and renewed strength. This was one of your best. I don’t know if I have a solution for dealing with negative feelings. I do know that they can be overwhelming, so I try to harness the power constructively and use those feelings to write lyrics or songs. Thank you so much for a great comment Rob. I’m so humbled that you consider this one of my best. I am a strong feeler actually, and when my feelings are too heightened, I can’t think clearly. I would never make a good leader because of that. Hahaha. I think it’s great the way you deal with it. You know, creatively. Writing lyrics or poetry (or anything for that matter) is a great way to get it all out. Some great work comes out of the harder feelings. Hope you’re having a great week Rob. p.s. I’m going to email you a song of mine that a I’m going to record. It’s actually a poem (or a mixture of two poems) I wrote. It is going to be use in a performing arts production. A friend of mine is a dancer and he’s going to create this production and wants to use this piece in it. Pretty excited about it. I emailed you back last night, Staci. I was kind of on an electronics blackout most of yesterday. I loved the song, and I’ve commented about what I think would compliment the sound. I can’t wait to hear your final version! Hey Rob, oh yes, I got the email. Thank you so much for the ideas. I want to see if I can somehow get the violin in there. I feel like I have no time, but I’ve got to somehow make it happen. I’m so glad you liked the song. Once it’s complete I’ll let you know ok.
Hope you’re having a good weekend so far. Mine has been very messy, dirty, painty, plastery… I can’t wait to get everything done. Good to see you, Staci. In answer to the question, I’m not sure I do. Heyyyyy Richard, great to see you too. I just returned from a two month hiatus. –Hahahaha, that’s surprisingly funny. I think a lot of people are with you there. PS your artwork was fab. Casting down every thought that exhausts itself over the knowledge of God. Boy is that a process. An ongoing and continual process, but a goal I am working to achieve. Beautiful work my friend. You have been honing your gift. Thanks for sharing your talent with us. Hi Wendy, please forgive me for the delay in responding. My life is all over the map right now with renovations, moving and preparing for two and a half months of travel. Ugh. I feel like if it was possible for me to take my head off, I would forget to put it back on. Hahaha. Thank you so much for your kind words of encouragement. I’m so glad you enjoyed this. Casting down every thought… is definitely a process, and tough when feelings are involved. I think it will be a continual process until we leave this earthly body eh. Hope you’re having a great week and enjoying you new job Wendy. Oh boy, that is a lot to juggle! Thanks so much Wendy. You have a great Sunday and a wonderful week ahead. Hi Natalie, thank you so much. I’m so glad you like this one. I’m with you on the tears. I cry a lot. I also cry it all out to Jesus. He puts things into perspective, doesn’t he. Have a wonderful weekend Natalie. Believing that God will see me through again..some days are harder than others and I still find myself giving in to depression..but I still believe God will see me through.. I know how you feel, and what you mean Angy. It’s not easy, but it’s comforting to know who we belong to, and that our time here is so short. I’ll be by soon to see your blog. 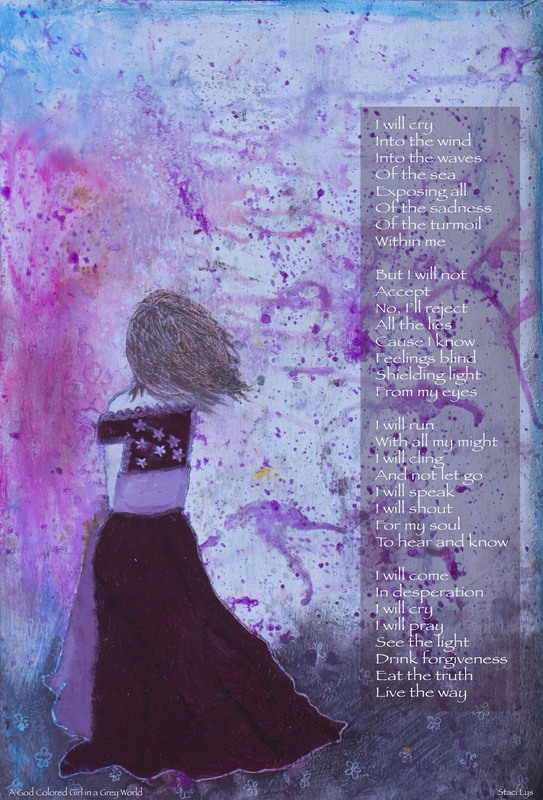 Staci, a lovely quote, amazing artwork, and brilliant title, “The Need” for a powerful poem. I love the first stanza. I read it as a declaration. I think that once we say certain things aloud, whether by pen or voice, we can’t hide them any longer, “I will speak / I will shout”. In this instance a feeling of “deep depression”. The last stanza is wonderful, especially, “Drink forgiveness / Eat the truth/ Live the way”. We agree that we’re more that same than different, with this in mind, I have to believe that all individuals experience overwhelming feelings. Everyone can put their own title on these feelings. What is the universal solution? I think you have so eloquently addressed it in your poem. Acknowledging our feelings and addressing our needs. Mia, thank you so much for such a wonderful comment, and for your kind words of encouragement and appreciation. I’m so glad that you appreciate the ‘no fluff’. Like you, I consider myself a realist. Let’s not try and hide the dark stuff now, right. Thank you, once again Mia. I am so pleased with your comment. Once again, have a wonderful weekend and take care. As for me, no taking it easy. I’ve been painting and plastering and getting all dirty. Preparing to move within the next couple of weeks. Ugh. Mia, it definitely is a lot of work. Sometime I look around and think there’s just too much to do. I wonder if we can actually get it all done before traveling. I’m afraid I’m going to have to take another break from blogging for a while. I feel like I have way too much on my plate right now. I look forward to getting back to having time to create and paint and write. I have a feeling that won’t happen until February. Ugh. Hope you’re having a nice week so far, and that the rest of it is great. So you are back. Hope you are not feeling depressed now, or ever. Hope you are doing good now. I love your concept. Crying your heart out sometimes clears it of negative thoughts that would other wise effect every decision you make in life. Crying is not a bad thing. Suppressing your feelings and emotions is. That’s a great idea Lorrie. To sit and analyze the feelings, and not let them just take control of you. And you are so right @ THIS TOO, SHALL PASS. It always does. Life is like that. Thank you so much, my friend, and please enjoy the rest of your day. Hi Staci, the weather hits hard on my feeling too. Love the last 3 lines of this poem and the little girl is cute as usual. Have a great day! Thank you so much Elizabeth. So glad you enjoyed this. Great message, Staci. I love how David opens his heart in the Psalms. I actually find writing the best outlet for expressing bad days. HI Mark, thank you so much. Oh yes, David is very open and transparent in his prayers in the Psalms. I think more people could learn from his ‘real-ness’. Oh yes, and not only leaning into His love, but literally clinging for dear life. Hahaha. I also love my daily devotional. I need to have that time. It’s our daily bread, isn’t it Audrey. Prayer, and friends who listen to hear me out first before lifting me with inspirational words of wisdom help. Sometimes I listen to what I call happy music. Hi Timi, so nice to see you. Isn’t that a great quote? That’s a great way to deal with negative feelings. I pray and talk with friends as well. Sometimes I try and talk to my husband, but men seem to have a difficult time just listening and being comforting. Ugh. Hi Mridul, so nice to meet you. Thank you so much for opening up and sharing here. I like what you said. I actually have a friend that would read the newspaper whenever she felt sorry for herself. She would read about things that are so much worse than her situation and start thanking God. Hahaha. I thought that was great. Thank you so much for your kind words of appreciation as well Mridul. Please take care and have a wonderful week. I will be by to visit your blog soon. Please have a wonderful rest of the week Crystal and take good care. “I will cry, I will pray. See the light, drink forgiveness, Eat the truth, live the way.” Words to live by right there Staci! This was beyond just beautiful. 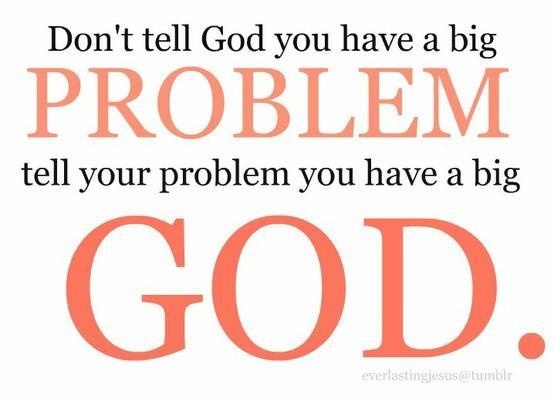 I try to do the same during my dark/negative times, I bow before him. And I believe the same, it’s only with Him and only Him, that our hearts can find peace and tranquility. Heyyyyyyy Zee, thank you so much. I’m so glad this touched you, and that you were able to relate to it. I’m so encouraged by your kind words of appreciation. Hope you are very well and enjoying your week. You ar so sweet Zee. I really appreciate you sweetie. Please have a wonderful week ahead. Hi Indah. Thank you so much. I’m so glad you enjoyed this. Heyyyyy Vashti, thank you so much. You always lift me up with your generous comments, my friend. I’m so sorry it’s taken me so long to respond. It’s because I had to turbo paint, plaster, renovate, move, etc. Then I had to take my dog to my inlaws up north. And now I’m preparing to travel to Canada and possibly Mexico until the end of January. I will, unfortunately, be away from WordPress until then. Ugh. I feel so out of the loop at the moment. I will be by sometimes to checkup on you while I’m gone though ok. Thank you so much ifatimafaye. You are so kind and I super appreciate your comment and appreciation of my work. It is so nice to meet you. I will be by your blog soon to check it out. WOW Girl. You are doing just the RIGHT THING. When GOD is with yo, beside you, above you, WHY WORRY ? See – “Just leave in the Hands of the Lord” Song. People tend to “Doubt” the presence of GOD, or they “forget about GOD” when they are sad and unhappy. But once you surrender your life to him , you will feel like a great weight has been taken off your shoulders. You will feel free and happy, because your have FAITH in GOD. I’m so sorry it’s taken me so long to respond. I’ve been traveling and didn’t even get a notification of your comment. I am currently in Canada and not returning to Brazil until the end of January. In the beginning to mid-January there is a chance I will be in Mexico. I’m taking a break from the blogging world during this time, but will be up and at it again once I return. Thanks again Cattie. Many blessings to you. You better return back to us, your Fans. I love your posts. Hi Staci, hope you had a good 2016…it’s been long. Lots to catch up. Hope you are doing good. That’s what I was surprised!!! WoW Staci, just wonderful to connect after it seems ages…great to hear that you are fine and O! I see you are in Peru…missing our lovely conversation and indeed waiting eagerly to see back here. Hope everything is fine at your end and take care!!! Looking forward to the month of Feb…. Hi Staci, When are you back? Ohhhhh, hi there my friend, Nihar. How are you? I hope you are doing well. I’m ok, a little stressed, but pushing through. I hope to be posting by the end of the week. Can’t wait for things to become normal and routine in my life. It takes some time, but I’m sure I’ll get there. I’ll be by to check on your recent writing soon. Staci, always such a pleasure to hear back from you, I understand not easy to get back to rhythm from such prolonged break but such breaks are needed, it takes little time but I am sure with the refreshing thoughts and new ideas that you must have gathered, it would be wonderful to see the glitter in your upcoming posts. Nihar, no worries at all for the delay. I totally understand. I find it very difficult to blog while traveling too. I was just over at your blog. Left a comment there for a fresh new conversation. How was your trip to the US? Where in the US were you? I was in Long Beach California, went for a conference and though the schedule was tight just manage to do sneak some time for going around and our drive to Phoenix was awesome…the sandy terrain is different from other part of USA. Staci, I have replied to your comment and great to start our conversation. Oh wow, Long Beach, California. And Phoenix, Arizona as well. Great stuff. Did you get the chance to visit the Grand Canyon? beautiful Staci, I usually turn to mother nature when I am down and my loved ones…I am fortunate to have family and friends around who are there for me during good times and bad and that helps…and of course I write 😀 Welcome back again and hope to see more of your posts soon! Thank you so much Neha. Turning to nature and loved ones are such therapeutic ways to deal with things when we’re down. We were made for relationship, and it is so vital to our mental and emotional health to have a community of friends and loved ones that we can turn to. I’m so glad you have that Neha. I hope to be posting again by the end of the week. Can’t wait to get back into the swing of things. Ohhhhh, a collaboration? I’ll have to see if I can. Thanks Neha. Hi Sonyo, I hear you, loud and clear. I grew up in Vancouver, Canada. It rains and rains and rains and rains… It’s horrible for me. It’s really affected me in the past when I’ve returned for a visit. Like you, I live in a much sunnier and warmer place now – Brazil. The best I have ever been was when we were in Jaipur, India for a few months. It was sunny every day, except one. I don’t think I had ever been so well emotionally as when we were there. Anyhow, please have a great Tuesday. Sure planning on it. Hehehe. I just loved your poem.. it’s beautiful..
Awww, thank you so much Navvirk. I’ll have to stop by your blog soon. Awwww, thank you so much Rosema. I’m all for being transparent and real. Staci – your words are powerful, awakening, energetic. Thank you for sharing! Thank you so much Mihrank. So glad you enjoyed it.